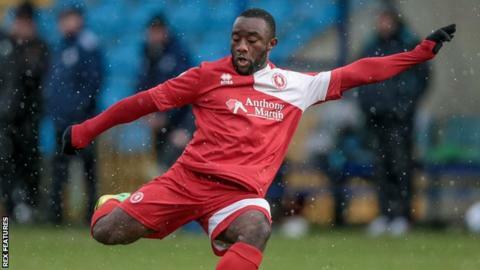 Welling earned a point against fellow National League strugglers Altrincham after Sahr Kabba's dramatic equaliser. Altrincham had chances early on, with Simon Richman's header saved by Marek Rodak before Jake Moult hit the bar. And the Robins' pressure told in the second half, as Michael Rankine lobbed Rodak superbly to break the deadlock. But in the last minute of normal time Kabba intercepted a Scott Leather clearance and smashed the ball into the roof of the net to equalise. Match ends, Welling United 1, Altrincham 1. Second Half ends, Welling United 1, Altrincham 1. Goal! Welling United 1, Altrincham 1. Sahr Kabba (Welling United) right footed shot from the right side of the six yard box to the high centre of the goal. Foul by Barney Williams (Welling United). Josh Ginnelly (Altrincham) wins a free kick. Hand ball by Dylan Mottley-Henry (Altrincham). Foul by Dylan Mottley-Henry (Altrincham). Sahr Kabba (Welling United) wins a free kick. Attempt blocked. Michael Rankine (Altrincham) left footed shot from outside the box is blocked. Substitution, Welling United. Sahr Kabba replaces Ade Yusuff. Barney Williams (Welling United) wins a free kick. Attempt saved. Michael Rankine (Altrincham) right footed shot from the right side of the box is saved. Substitution, Welling United. Michael Bakare replaces Xavier Vidal. Substitution, Altrincham. Dylan Mottley-Henry replaces Jonathon Margetts. Goal! Welling United 0, Altrincham 1. Michael Rankine (Altrincham) right footed shot from the centre of the box to the centre of the goal. Foul by Luke Wanadio (Welling United). Jake Moult (Altrincham) wins a free kick. Foul by Jonathon Margetts (Altrincham). Harry Lee (Welling United) wins a free kick. Luke Wanadio (Welling United) wins a free kick. Attempt missed. Jonathon Margetts (Altrincham) header from the right side of the six yard box is too high. Assisted by Josh Ginnelly. Second Half begins Welling United 0, Altrincham 0. First Half ends, Welling United 0, Altrincham 0. Attempt missed. James Ferry (Welling United) right footed shot from outside the box misses to the left. Attempt saved. Josh Ginnelly (Altrincham) right footed shot from the left side of the box is saved. Marcus Holness (Altrincham) is shown the yellow card for a bad foul. Attempt saved. Luke Wanadio (Welling United) right footed shot from the centre of the box is saved. James Lawrie (Altrincham) wins a free kick. Attempt saved. Josh Ginnelly (Altrincham) header from the centre of the box is saved.